First revealed back in December 2017, Qualcomm has a master plan to take over the mobile computing world: bring its Snapdragon smartphone processors to laptops and tablets to make computers work more like phones, starting with the Snapdragon 835. Concocted in tandem with Microsoft and its Windows 10 S operating system, these laptops and tablets – of which there are three so far: the Asus NovaGo, HP Envy x2 and Lenovo Miix 630 – use the unique power-management capabilities and built-in LTE connectivity of Snapdragon processors to create truly always-on and always-connected Windows 10 computers. Let’s just say that this major move by Qualcomm has the laptop world talking, and we’ve asked all the major manufacturers what they think. If you ask those who have bought into Qualcomm’s mission, i.e. the aforementioned device-makers, that’s exactly what these chips do. Of course, those who have yet to dive in either have serious doubts or have their toes in the water, so to speak. However, the most recent Acer Swift 7 is not a Qualcomm Snapdragon 835 laptop, but rather one with a 7th-generation Intel Core i7 processor and Intel LTE cellular modem inside – it claims up to 10 hours of battery life compared to Qualcomm’s offering of 20. Acer clearly wants to see whether it can go toe-to-toe with these Qualcomm laptops with a more tried-and-true offering before taking the plunge. Meanwhile, Lenovo is wasting no time picking up what Qualcomm is putting out. It’s clear that Lenovo believes Snapdragon is the way forward to this type of computing experience, and so does Asus. There’s a clear thread here between the creators of the first three Snapdragon laptops and existing relationships with Qualcomm through their phone businesses. Both Asus and Lenovo (and Motorola) have been releasing Android phones with Qualcomm’s chips inside for years, while HP has recently got into the game with phones like the Elite x3. “We're really interested to see how customers respond to the LTE support that's built in as a standard on this product as well [as that], right now, basically all of the major carriers in the US [and] around the world,” Nash adds. That said, not every laptop maker is necessarily gushing about this new wave of mobile Windows 10 machines. Some companies, like LG and Dell in particular, seem to have their feet firmly planted on the other side of the fence. “LG currently has no plans to include Snapdragon in its lineup of premium ultra-light LG gram laptops,” Hyukki ‘HK’ Kim, director of IT and product management for LG, tells us. “When comparing our LG gram lineup with the Intel processor to other previously launched devices, we did not find any with longer battery life,” Kim adds, referring to the 13-inch LG gram laptop’s claim to 22 hours of battery life on a charge. Meanwhile, Dell seems to think that it’s achieved Qualcomm’s vision of ‘always-on, always-connected’ mobile PCs just fine on its own (and with Intel). 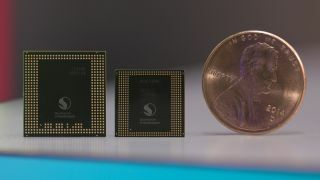 Samsung, one of Qualcomm’s biggest partners and customers worldwide through its Galaxy phone business, is surprisingly hesitant integrate Snapdragon into its laptops. But, the firm’s restraint to fully buy into Qualcomm’s vision seems to have more to do with Microsoft’s baggage regarding Windows on ARM-based processors than anything. Lenovo's Miix 630 running on Snapdragon. Will Snapdragon’s ripples turn into waves? While it’s still early days for Snapdragon-based Windows laptops and tablets, one can’t help but wonder what effect these devices will have on the laptop scene at large. For the longest time, almost every Windows laptop and tablet runs on an Intel chip, save for the odd AMD option. Will that paradigm be truly shifted, thanks to Qualcomm? In particular, Tamaki sees this breed of laptops and tablets being particularly popular with professionals like journalists and real-estate agents – people whose careers see them constantly on the move. On the other hand, Lenovo sees a wider impact in the tea leaves, but Snapdragon’s success in the PC world rides quite heavily on distribution and carrier data plan pricing. Of course, despite that, we’re told that Lenovo is confident in a ‘bright future’ for the ‘always-connected’ PC and that it’s working hard on the network operator piece of the puzzle. If you ask Samsung, the baggage of two previously failed attempts at Windows on ARM could weigh heavily upon the masses, but an even bigger factor will be whether power management or performance are considerably compromised in the endeavor. In this case, HP is simply following what it believes in ‘based on insights from customers,’ we’re told, that folks certainly want power and the flexibility of a 360 design from their laptops and tablets. But, as HP’s consumer insight data tells it, there’s an increasing amount of people that are doing more on their computers on the go than ever before, hence the draw of the LTE-equipped, always-connected PC. To Acer, it all comes down to brand positioning and messaging, which at this point requires quite a few parties – Qualcomm, Microsoft, the device makers and the carriers – to all work together.